On May 31, 2013, asteroid 1998 QE2 will sail serenely past Earth, getting no closer than about 3.6 million miles (5.8 million kilometers), or about 15 times the distance between Earth and the moon. And while QE2 is not of much interest to those astronomers and scientists on the lookout for hazardous asteroids, it is of interest to those who dabble in radar astronomy and have a 230-foot (70-meter) — or larger — radar telescope at their disposal. The closest approach of the asteroid occurs on May 31 at 1:59 p.m. Pacific (4:59 p.m. Eastern / 20:59 UTC). This is the closest approach the asteroid will make to Earth for at least the next two centuries. Asteroid 1998 QE2 was discovered on Aug. 19, 1998, by the Massachusetts Institute of Technology Lincoln Near Earth Asteroid Research (LINEAR) program near Socorro, New Mexico. International leaders in asteroid and comet research are gathering at the University of Central Florida in Orlando Friday, Feb. 15, for a special “viewing party” that will climax with asteroid 2012 DA14 zipping between Earth and orbiting communication satellites (within 14,000 miles of Earth). The asteroid, the size of a city block, will squeeze by Earth’s atmosphere and the geostationary satellites orbiting the planet. It will be the closest fly by in history. Experts say there is no chance the asteroid will hit Earth — this time. But with more than 4,700 asteroids NASA has identified as potential threats to Earth, some as big as 16 football fields, these objects are getting a lot of attention. Should an asteroid be detected on a collision course with Earth, it will be critical to know its composition and structure in order to deflect it. The impact of a small asteroid like DA 14 would equal the destructive power of an atomic bomb. A larger asteroid could be catastrophic. The world’s first privately funded deep space mission – SENTINEL – received major support this week from prominent members of the business and financial community who joined the B612 Foundation’s Founding Circle. Founding Circle Members not only contribute substantial funding to the mission, but also pledge continued support in multiple areas of finance, technology and science. In June, the B612 Foundation unveiled its plans to build, launch, and operate the first privately funded deep space mission, a space telescope to be placed in orbit around the Sun, ranging up to 170 million miles from Earth, for a mission of asteroid discovery and mapping. This premier scientific instrument will not only provide millions of asteroid discoveries, but may also help us prevent a major asteroid impact on Earth. Sentinel will detect and track asteroids accurately enough to give decades of warning of impending impacts, enough to allow humanity to easily deflect threatening asteroids using existing technology. Discovered by the Catalina Sky Survey in Arizona on August 26, 2012, PHA (potentially hazardous asteroid) 2012 QG42, an asteroid the size of a 14-story building, will make its close approach to Earth Thursday evening (September 13) — just months after newly discovered asteroid 2012 LZ1 paid an unexpected visit to Earth on June 16th. Slooh Space Camera will cover its near-approach on Sept. 13, live on Slooh.com, free to the public, starting at 4:00 p.m. PDT / 7:00 p.m. EDT / 23:00 UTC — accompanied by real-time discussions with Slooh President Patrick Paolucci, Slooh Engineer Paul Cox, and Astronomy Magazine columnist Bob Berman. Viewers can watch live on their PC or favorite iOS/Android mobile device. The asteroid is estimated to be 190-430 meters (625-1,400 ft) across and will pass within 7.5 times the Moon’s distance from our planet. Due to its proximity to Earth and size, 2012 QG42 qualifies as a “potentially hazardous asteroid”, which means that it could collide with Earth in the distant future. According to the internet hysteria surrounding the ancient Mayan calendar, an asteroid could be on its way to wipe out the world on December 21, 2012. Obviously this is pretty unlikely – but if an asteroid really is on its way, could we take a cue from the disaster movie Armageddon in order to save the planet? According to science research carried out by University of Leicester physics students, the answer is definitely “no”. Researchers anticipate that asteroid 2011 AG5, discovered in January 2011, will fly safely past and not impact Earth in 2040. Current findings and analysis data were reported at a May 29 workshop at NASA’s Goddard Space Flight Center in Greenbelt, Md., attended by scientists and engineers from around the world. Discussions focused on observations of potentially hazardous asteroids (PHAs). “While there is general consensus there is only a very small chance that we could be dealing with a real impact scenario for this object, we will still be watchful and ready to take further action if additional observations indicate it is warranted,” said Lindley Johnson, program executive for the Near-Earth Object (NEO) Observation Program at NASA Headquarters in Washington. Several years ago another asteroid, named Apophis, was thought to pose a similar impact threat in 2036. 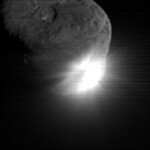 Additional observations taken from 2005 through 2008 enabled NASA scientists to refine their understanding of the asteroid’s path, which showed a significantly reduced likelihood of a hazardous encounter. The work of a University of Tennessee, Knoxville, professor has helped reveal a rare orbital shift and the density of an asteroid that will pass close to Earth. Josh Emery, assistant professor of earth and planetary sciences, and the team of the NASA asteroid sample return mission called OSIRIS-REx have measured the weight and orbit of 1999 RQ36. They have found the asteroid has a low density and its orbit has drifted roughly 100 miles in the last twelve years. This deviation is caused by the Yarkovsky effect.